Age range: Late 4 to 5 year old. Our pre-kindergarten program provides an environment organized for active, hands-on learning for each child. 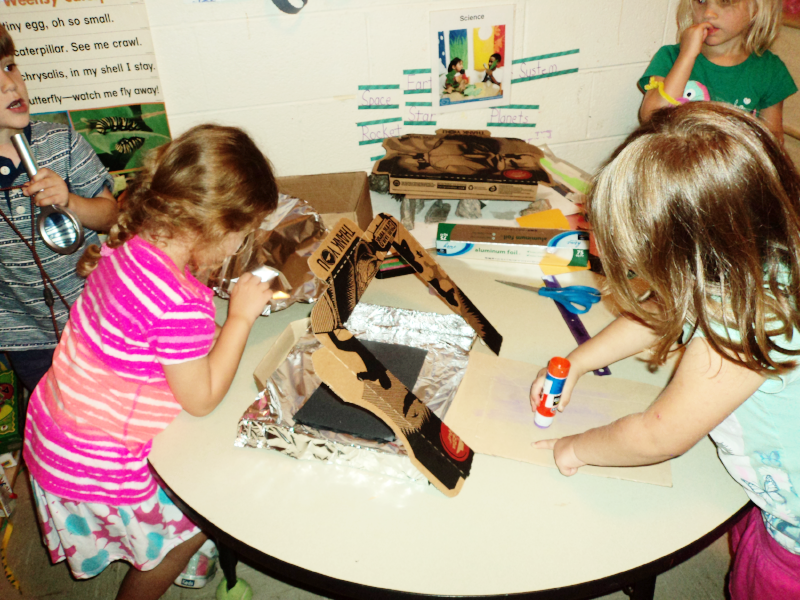 Activities use play as an important learning tool to support our exploration/ play based learning environment. 7:00am- 9:00am Center Opens, Welcome! 3:30pm-6:00pm Free Choice Play, Outside play, (Weather Permitting )Pick-ups and Farewell. Depending on the needs/ interest of the children and / or weather, schedule may change. The project of making a solar oven started when some of the children said they had never been camping. Children who had been camping gave details about camping being fun and how good s’mores are. From this, we agreed that our class should go camping. We had many discussions on what we need and what people do when they go camping. The big question, how can we make s’mores without a real fire? This led to research on how to make a solar oven. (Problem solving) Instructions were printed and the children went to work taking turns and helping each other. (Social/emotional) Rulers were used to mark where to cut, the marked lines were cut and then glued aluminum in place. (Number recognition and fine motor skills) Then we put our s’mores in the ovens and waited. The result: After nap we ate our s’mores for snack. Yum, yum!